Well that was exciting – I was sleeping late as usual after having breakfast. Everyone else had left the house for school or work, and then at about 1.15 I woke up to the sound of water running! Checked the bathroom, nothing there, sound was coming from downstairs. 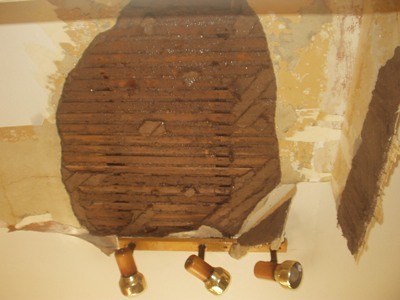 Then went into the kitchen – where part of the ceiling had come off and water was running down. Phoned mum, and then ended up phoning the fire brigade who are located really near us anyway. It wasn’t that serious but obviously since the water was still flowing, and the lights were very close, I wanted to be safe. No one hurt, not much damage at all, insurance covers it. But it was an interesting afternoon though! Hmmm, I don’t know what I’d do actualy. Great insight into your home though, and of course your late awakenings. Nasty, just luck it didn’t get onto the lighting! 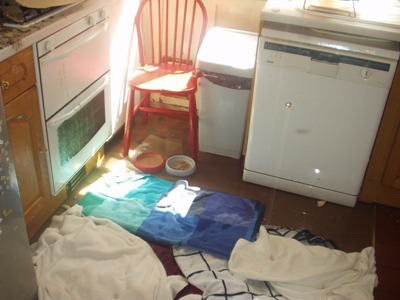 Breaking news – Labour supporter has dishwasher!!! 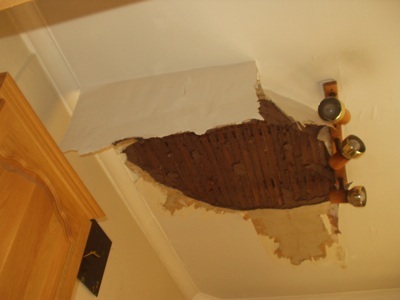 I guess I’ll never witness the ceiling like that in my house since there’s no upstairs! All we have are the flats roof being on the top floor and all. It looks good though, so I might leave the bath running sometime to see what it does to the people underneath!